I try my best to offer advice based on the knowledge that is been passed down to me by highly successful people and first-hand experiences. I do this to make sure I'm not bullshitting anyone and I can offer realistic expectations on what you need to overcome the many challenges life presents to you in your career and in life. This year so far has been one of the most challenging years I've experienced in my entire life. I was presented a whole new set of obstacles that I never faced before and put in situations that made it nearly impossible to move past. Even with the arsenal of tools that I have at my disposal I was still worn weary and taken back by some situations. I'm also at a stage in my life where I'm becoming increasingly more comfortable with talking about my personal life as you can see here, here, and here. But, currently I'm still navigating uncharted waters that I'm not quite ready to share with the world. I also don't think any amount of passive aggressive posts or cryptic messages change the reality of one's situation. I would rather focus on embracing positivity and love. If there is one thing each of us are in control of it's our mind, body, and spirit. I'm writing this post for those of you who are going through tough, confusing, and ultimately challenging times. Understand that you are not alone. At times, each and every one us feel scared. Sad. Angry. Frustrated. Lonely. Each one of us at one stage in our lives have asked ourselves, "Am I good enough? ", "Can I do this? ", "Am I loved? ", etc. I say this to you... "Nunca Te Rindas". Never Give Up. No matter how many disappointments you face. No matter the failures that get you down and make you second guess yourself. No matter the cold toxicity of other people's insecurities and lack of self-awareness that gets thrown at you. No matter how overwhelming that sinking feeling of despair you have. Never give up. Keep moving forward. Stay positive (which may seem impossible at times). Always remember that life is supposed to be hard at times, that's why the "sweet is never as sweet without the sour". 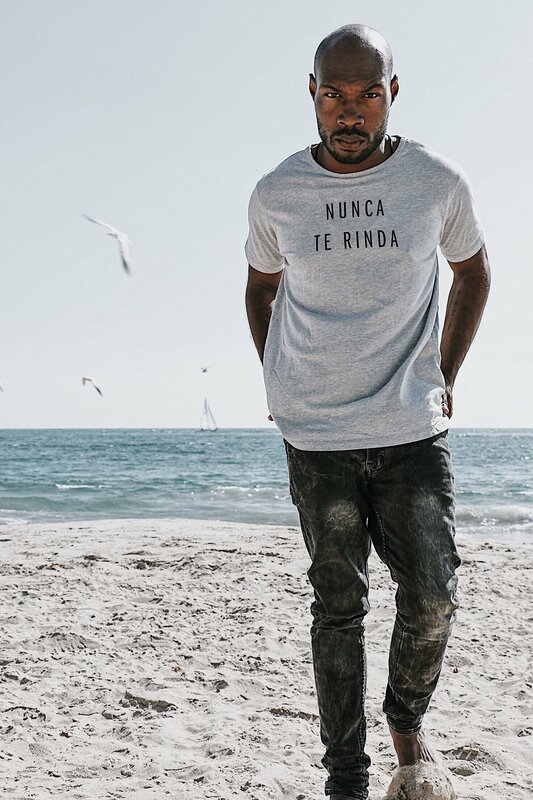 In tough times, repeat this to yourself "nunca te rindas". Provide a random act of kindness to someone you care about or even a complete stranger. Accept love and positivity. Send it back out to the rest of the world. Love yourself. Respect yourself. Be kind to yourself. What You Get: I customized my shirt with Apolis. Check out their catalog here.